Matthew Hartley, Lower Sixth, reflects on a lecture given by the highly regarded Dr Kathryn Tempest. 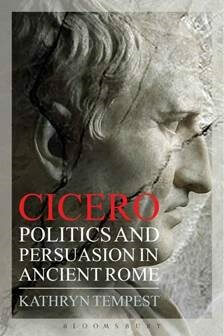 As a pupil studying Classical Civilisation A Level at Teddies, I have just used Dr Tempest’s book ‘Cicero, Politics and Persuasion in Ancient Rome,’ to help define the nature of Julius Caesar. It was a privilege for the Lyne Society to sit down with Dr Tempest at dinner and then later hear her speak in the Old Library for the first time at Teddies in six years. Dr Tempest spoke eloquently and captivated her audience with detailed, intriguing tales of Cicero’s oratorical performances. Dr Tempest began with the society of Rome and the situation Cicero found himself in, fighting against the patrician elite; she compared it to a ‘nobody’ going up against people like Trump, where the patrician had both money and a famous name that voters already knew. As a novus homo, new man, Cicero had to define himself in his speeches, using his enemies as a way to do this. Dr Tempest talked about the law courts of ancient Rome being a part of the entertainment and therefore Cicero would have had to enrapture the crowds with articulate and different language in order to win the case, whilst promoting himself. To do this, Cicero would have to create enemies of the moment. rhetorical methods in order to exclude Verres from society and make it easy for the jury to find him guilty. One such way was to shame his name. In Latin, Verres means ‘broom’: at one stage in his speeches against Verres, Cicero mentions that Verres ‘swept Sicily clean of its wealth.’ Cicero also vividly pictured his dress and appearance in a demeaning manner that politicians today could not use. He asked the crowd (not just the jury) to imagine Verres atop a litter held by eight bearers on a pillow stuffed with rose petals, Cicero here playing on all their senses and desire for tittle-tattle. He says that Verres was under the thumb of women, asking what would happen if he undid his toga to show the ‘scars inflicted by the bites of women,’ as opposed to war wounds, showing the crowd that Verres was acting in a way deemed unfit for a Roman senator. Dr Tempest went on to speak about the famous Catiline of the Catilinarian conspiracy. She said that Cicero alleviated the people’s fears in the senate house against the man, shaming him so much that he left Rome to go to his army mustered about 100 miles away. Cicero used a wealth of tactics in order to exclude people from society, such as their facial appearance, their avarice, that they weren’t worthy of their family’s name or that their family’s history was embarrassing. After swiftly summarising all of the hostile techniques used, she then asked who best fitted the description out of all Cicero’s enemies; this person was found to be Mark Antony. When looking at an overview, it is clear that Mark Antony was Cicero’s most powerful enemy, Antony eventually ending Cicero’s life with his head and writing hand pinned to the public speaking platform (Rostra). Kathryn Tempest finished with the idea that Cicero’s humour and the jokes he made to exclude people from Roman society, give us a valuable insight into Roman society and its values. In short she had proved that Cicero was perhaps one of the greatest, and indeed wittiest, orators, certainly from all Greco-Roman culture and probably of all time.